A lot has happened in the past couple months since my departure from Syracuse and move to New York City. After finishing up my last semester at Newhouse, the day before I drove a 12-foot cargo van to NYC, I shot a story for the ACLU called, The Cost of Patenting Genes. The story is a tragic look at the consequences of patenting genes, and the suffering endured by Kathleen Maxian since being diagnosed with advanced-stage ovarian cancer. Although I only had the chance to work with her for a day, Kathleen struck me as one of the most genuinely inspiring, positive, and hilarious individuals I have ever had the opportunity to meet. She is also extremely passionate and driven to educate and build awareness about the injustices of gene patenting. Last week, the video was published online in conjunction with the launch of the ACLU's Take Back Your Genes campaign to raise awareness about the threats posed by gene patenting. Watch her story on the ACLU's site. Since beginning my internship at MediaStorm in January, I had been consumed with production of an ongoing multimedia project for the Council on Foreign Relations. 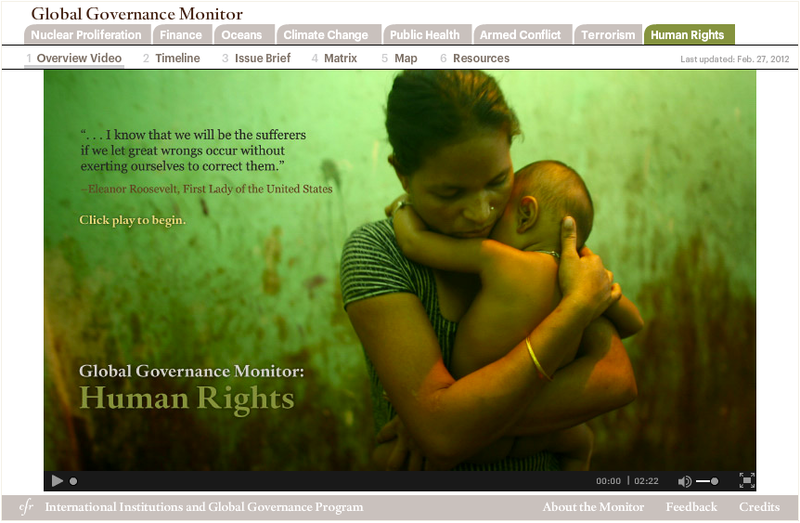 This week, the International Institutions and Global Governance Program at the Council on Foreign Relations, in collaboration with MediaStorm, launched the eighth issue of its comprehensive Global Governance Monitor: Human Rights. The Monitor is an interactive multimedia tool that maps and evaluates efforts to tackle the most pressing problems facing the world. The lastest installment tracks the international community’s record in responding to the global challenge of human rights by providing a cinematic overview of the issue, and an interactive resource guide. This project, spanning multiple years, has been a Webby honoree in the category of Rich Media: Non-profit/Educational in both 2010 and 2011. Visit the interactive online, and learn more about MediaStorm's collaboration on this extensive project.